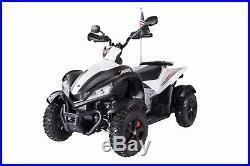 RiiRoo Kids Ride On ATV QUAD BIKE Electric Childrens 12V Battery Toy Car Scooter. Give your little driver a stylish ride with this cool RiiRoo ATV ride-on toy. Designed just like the real vehicle, this ATV can go up to 5 km/h and is decked out with LED lights and a Bluetooth music player. This is the ideal birthday gift for your children, it is easy to ride push and go chunky foot pedal and instant stop, when released, makes it an ideal starting point for that first introduction to battery powered ride on toys! With its unique style and looks - the build quality is absolutely fantastic and tough on this Quad. Not only does it have Eva tyres but also a very hard toughened plastic shell and metal axles for the wheels and steering. Steering Controls - Working Horn. Battery Voltage: 12V Battery AH: 7Ah Battery QTY: 1 Motor Wattage: Motor QTY: Charger Type: UK 3 Pin Charger Wheels: UbberGripz Rubber Wheels Box Dimensions: 113 x 62 x 46cm Box Weight: 30KG Assembled Dimensions: 116 x 64 x 80cm Product Weight: 25KG Maximum User Weight: 40KG Approx Speed: 5 - 7KM/h. Once you have received your item please make sure that the item is. For the recommended amount of. We also suggest giving the item a. If the item is not being used for a long period of time or is being put away for a Christmas present we advise to. Charge it every 3 weeks. We RiiRoo, do sincerely swear that we are all about fun, kids, safety, adventure and the great outdoors. It is our mission to extract children from LCD screens and get them out the house... Even if it takes 12-volts to do it! We source, supply and maintain a hand-picked roster of the most exciting, durable, safe and affordable ride-on toys for kids big and small. We are a (grand)parent's secret weapon, an arsenal of the finest electric scooters, ride-on cars, jet-fighters, tractors, Segways, dirt-bikes, mini-motos and petrol go-carts to suit budgets great and small. We believe they'll thank us both when they're older! Our in-house technicians will be on hand for any technical issues that you need help resolving. Their in-depth knowledge and vast range of parts will get you up and running in no time. With years of experience as online retailers we are 100% confident of our security measures and we want you to be too! If you have any concerns with online shopping or are not sure how to use our website grandparents! RiiRoo Ride & Roll is all about providing quality products at the best possible prices that get kids outdoors, active and having fun! IPads and Playstation's are great but they don't make real memorable childhood memories. We need to encourage our kids to be active, to start exploring, to not fear the unknown. Let them try the car, the scooter, the hoverboard, give anything a go. Give them a toy that will create happy memories they'll never forget. RiiRoo Kids Ride On ATV QUAD BIKE Electric Childrens 12V Battery Toy Car Scooter Give your little driver a stylish ride with this cool RiiRoo ATV ride-on toy. This is the ideal birthday gift for your children it is easy to ride push and go chunky foot pedal and instant stop when released makes it an ideal starting point for that first introduction to battery powered ride on toys! With its unique style and looks - the build quality is absolutely fantastic, and tough on this Quad. 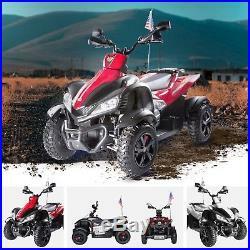 FEATURES: Large EVA tyres Led Lights Volume Control Front & Rear Wheel Sock Absorbers Sounds MP3 interface Powerful 12V battery Realistic scale replica of a real quad SPECIFICATION: Max Capacity:30KG Suitable Age:3-7 Years old Battery:1X12Volt/7Ah1 Speed:5-7 Km/H Dimension:116×64×80C­­­­­M Charging Time: 6-8 hours, can run 1-2 hours PACKAGE INCLUDES: 1 Ride on Quad 1 12V rechargeable battery for the car 1 User? S manual book 1 Battery Charger. Front & Rear Wheel Sock Absorbers. Sounds MP3 interface Powerful 12V battery Realistic scale replica of a real quad SPECIFICATION: Max Capacity:30KG Suitable Age:3-7 Years old Battery:1X12Volt/7Ah1 Speed:5-7 Km/H Dimension:116×64×80C­­­­­M Charging Time: 6-8 hours, can run 1-2 hours PACKAGE INCLUDES: 1 Ride on Quad 1 12V rechargeable battery for the car 1 User? 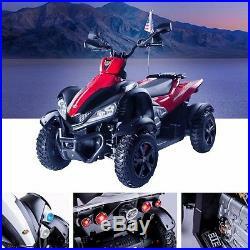 The item "RiiRoo Kids Ride On ATV QUAD BIKE Electric Childrens 12V Battery Toy Car Scooter" is in sale since Saturday, December 9, 2017. This item is in the category "Toys & Games\Outdoor Toys & Activities\Ride-on Cars\Electric & Battery Powered". The seller is "hello_riiroo" and is located in Corby.